I was so fortunate to be given the chance to go to the Seattle area for a quick work trip, and even more fortunate that my mom and sister wanted to tag along. We made a long weekend of it and settled in to the West Coast. 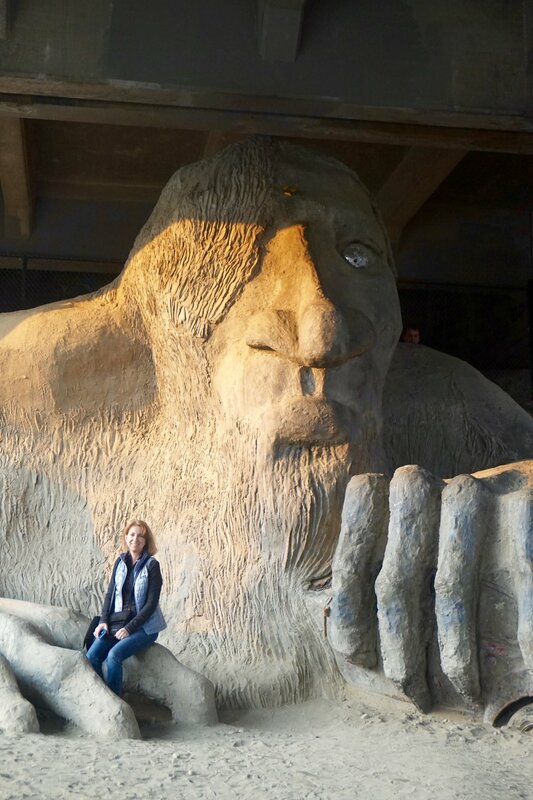 This big guy has been tucked beneath the Aurora Bridge since 1990, and pays homage to Scandinavian folklore. Visitors are encouraged to explore and poke around. We meandered down to the water to peek at the city's houseboats. And we were treated to this gorgeous sunset. Many thanks to Carl for the recommendation to check out Gas Works Park with the other locals! Luckily we did this on the clearest night, for the next few days gave us more of the typical Seattle overcast skies. We were staying in Bellevue and didn't rent a car to get around, so we decided to conquer the local bus system to save money on cab rides. It's a quick 30ish minute ride to Seattle proper. We dashed downtown and jumped on the ferry to see a magical little spot. Land ho! Bainbridge Island. On days when city living has gotten the best of me, I'll imagine that I live here. We followed a hidden little trail that promised to lead to the water. So. Much. Green. This ain't your typical East Coast beach. Not twins, just sometimes in sync. It's the perfect spot for some moody snaps. I get it now, Mr. Cobain. I think we all agreed this was the highlight! There's a charming downtown area too, with lots of shops and restaurants - definitely not to be missed. The rain only kept coming as the afternoon went on. But we wouldn't miss out on the iconic Pike Place Market. We didn't see any of the flying fish, but I did squeal like a little girl when the fishmonger tugged on the end of a fishing line making that big monk fish do a little dance. A quick peek down Post Alley is all I really wanted. It's also known as Gum Wall... and we quickly moved on. If the long long line isn't obvious, this is the very first Starbucks. (Don't be fooled by the one on 1st and Pike.) We decided not to wait and go in. This location sells all the same coffee as your neighborhood locations, and we decided it just wasn't worth it. Tip: Go to the one on 1st and Pike to purchase the swag only found at these 2 original locations. I'm jumping quickly ahead to the following morning when we visited Seattle's most iconic symbol. We had some clear skies to get a nice view from the top before fog and drizzle came in that evening. Did anyone else get weird vertigo from the Space Needle? Or am I the only wuss? So happy my mom and sister got to join me on this little adventure. As much as I love visiting other countries and exploring new cultures, there's certainly something to say for checking out a new place stateside.